There are few foods that come close to falafel's first bite: the crisp-fried exterior gives way to a creamy center of seasoned mashed beans, garlic, and parsley. Originating in the Middle East, but now common worldwide, these legume-based patties can be customized to take on the flavor of any place. Whether you are looking to be transported to an exotic location or just enjoy something different at home - the Authentic Foods Falafel Mix is a must try. The Authentic Foods Falafel Mix is made from the Authentic Foods Garfava Flour and a combination of savory seasonings and herbs. Feel free to add your own seasonings and enjoy falafel in in pita sandwiches, salads or alone. In addition to falafels, you can use this mix to create savory breadings for fish, chicken or vegeables; baked veggie burgers; and vegetable pancakes. Try using tahini sauce, tzatziki sauce and hummus to add a little something special to your next dish. 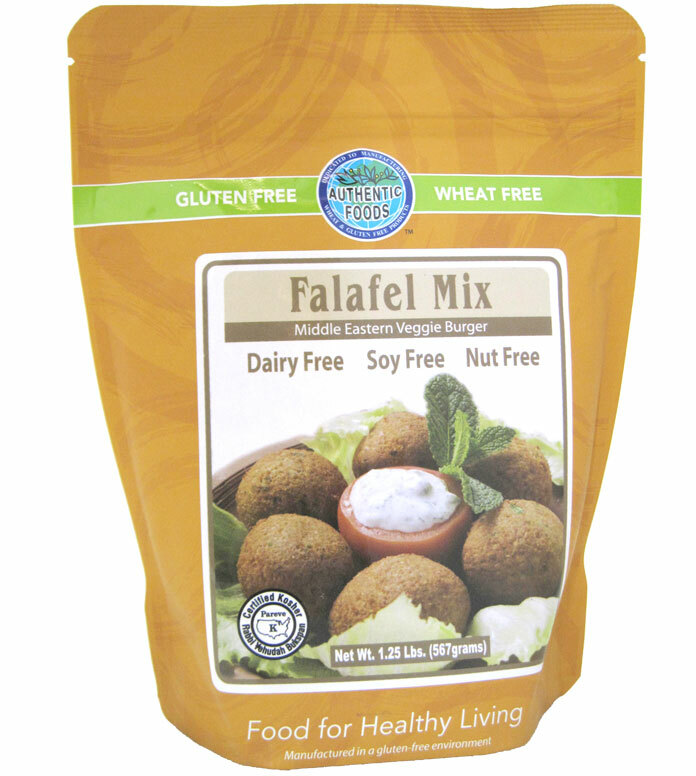 Whether you are a fan of Middle Eastern food, looking to try something new or looking for some great tasting foods to maintain a healthy lifestyle the Authentic Foods Falafel Mix is perfect for you. Baked falafels are about 100 calories each with 3 grams of fiber and only 1 gram of fat. Mix carbonated water, oil, minced garlic, chopped cilantro and salt. Then mix in the Authentic Foods Falafel Mix. Let the mixture stand for five minutes to absorb the liquid. The batter should be thick. Heat oven to 350 degrees Fahrenheit. Form small size patties and place them on a cookie sheet. Bake them for 15 to 25 minutes until golden brown on top. Using a spatula, flip the falafel burgers over and return them to the oven. Bake another 5 minutes or until golden brown. 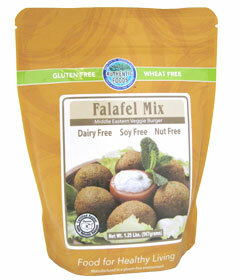 In a bowl, mix Authentic Foods Falafel Mix with Authentic Foods Maple Sugar. In another bowl, beat together eggs, water and oil. Then mix this into the falafel mixture. If the batter becomes too thick, add water to thin. Preheat griddle or skillet that has been lightly coated with oil to keep pancakes from sticking. Using a large tablespoon drop batter to make 4 inch diameter pancakes. Cook first side until bubbles form and begin to pop, and edges look dry. With a spatula, turn the pancakes over until the second side is golden brown. Serve them with sour cream cucumber yogurt (tzatziki sauce), tahini sauce or applesauce.